Home » Columns » No one killed Khashoggi! Jamal Khashoggi, a Saudi Arabian journalist in a self-imposed exile from the Gulf nation since 2017, entered the Saudi Arabian consulate in Istanbul, Turkey on October 2 and never returned. Khashoggi, who was critical of the Saudi government and Crown Prince Mohammed bin Salman in his articles, had gone to the consulate to collect documents that would enable his wedding with his Turkish fiancée, who had accompanied him there but chose to wait for him outside. An author and former editor-in-chief of Al Arab News channel, he was captured by CCTV cameras entering the consulate but not exiting it, raising questions about his whereabouts. With the media raising a hue and cry world over, the Saudi Arabian government after denying its involvement for close to three weeks, finally admitted on October 20 that Khashoggi was indeed killed in its consulate in Istanbul. Saudi’s Foreign Minister Adel al-Jubair attempted to distance Mohammed bin Salman from the journalist’s demise by terming the killing a ‘rogue operation’ but failed to blunt an international uproar that could test Saudi Arabia’s status as a regional power. “We are determined to uncover every stone. We are determined to find out all the facts. And we are determined to punish those who are responsible for this murder,” Adel said in an official statement. Turkish officials believe that Khashoggi was murdered and his body was removed. According to reports, Turkish sources claimed that he was cut up alive by a hit squad, who listened to music while dismembering his body. Loud screams could then be heard, which only stopped when he was injected with an unknown substance, said the sources in interviews with local media. Later, his body was allegedly cut up by the squad. According to a report by The New York Times, the journalist’s body is said to have been dismembered with a bone saw brought by the suspects. Turkish sources also unveiled CCTV footage showing a man, an alleged Saudi operative, leave the consulate dressed up in Khashoggi’s clothes. The footage also shows him disposing of a fake beard and coming out of a restaurant after changing his clothes. The alleged body double was spotted at various locations of Istanbul. The video that was released by the CNN to the world, added fuel to the fire, creating more uproar across the world. US President Donald Trump stated that Saudi Arabia’s account of the killing is “all over the place”, but also said he preferred sanctions against Riyadh, which do not include cancelling multibillion-dollar defence deals. This move by Trump has come under a lot of condemnation owing to the lack of toughness in his stance. The United Nations issued an official statement stating that it is “deeply troubled” by the news of Khashoggi’s killing. UN chief António Guterres called for a “prompt, thorough, transparent” probe into the circumstances of the killing and urged full accountability for those who were involved. The United Kingdom, France, Germany, Spain, Yemen, UAE, Egypt, Bahrain and many others strongly condemned the killing and have been vocal about their dissatisfaction over the explanation given by Saudi Arabia to the world. But the US and the UK, which have been good allies of Saudi Arabia – the world’s top oil exporter – have only given out farcical statements of condemnation while the whole world expects sterner action against the gulf nation. On being asked if he thinks Crown Prince Mohammad bin Salman could be believed, Donald Trump, much to the entire world’s surprise said: “I want to believe him. I really want to believe him. They’ve been a very good ally. Such a response from an American President, even by Trump’s own unconventional standards, is bizarre. With this response, Trump made it clear that he is ready to go out of his way to believe what bin Salman has to say, just to keep the business between the two countries going. The opprobrium from several nations, netizens and media shows that the killing of Khashoggi seems to have done no good to the ‘reformer’ image of Mohammad bin Salman, while on the other hand it is a huge political boost to Turkey’s President Recep Tayyip Erdoğan and his aspirations of regional supremacy. At a meeting with Islamic leaders, Erdoğan called Turkey as the “only country that can lead the Muslim world,” showing signs of claiming supremacy yet again. Erdoğan, who is known for his anti-west political ideology, since his 2002 election as prime minister to his current presidency, has constantly eroded Turkey’s historically secular framework, tilting the nation away from the West and towards the Middle East. With an anti-West foreign policy, Erdoğan is evidently trying to increase his leadership activities in the Organisation of Islamic Cooperation (OIC). And the global outcry after the killing of Khashoggi has turned into a weapon in armoury of the Turkish President, and he is expected to use this against the Saudi Crown Prince in the OIC. “It takes many deeds to build a good reputation, and only one bad one to lose it,” said Benjamin Franklin and it seems apt in the case of bin Salman. Allowing women to drive, among other reforms that he has implemented had the West praising him for his liberal approach. His idea of Islam, the “sensible, simple religion that needs to be brought back to liberal stances from the radical hijackers”, is appreciated world over. But “is it all a facade?” is the question that the West now seems to be asking. All those who took him to be a ‘reformer’ are now in two minds, owing to his government’s bullish acts. While women are allowed to drive and vote, women activists like Loujain al-Hathloul are put behind bars. 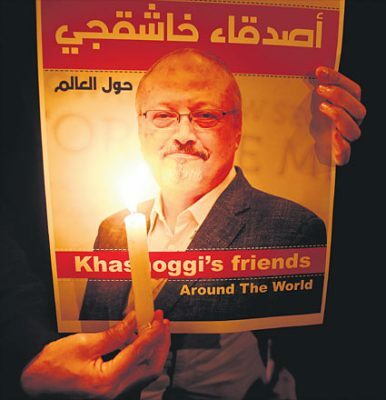 While putting up a more liberal face in front of the world media, journalists like Khashoggi, who are critical of the government, are eliminated. One after the other, the actions of MBS – as he is popularly known – are slowly but surely tarnishing his reputation as a reformer, notwithstanding the silent support from his allies from the Western world. The information filtering out is clearing the mystery over the killing of Khashoggi, with all fingers pointing towards MBS and his government. Yet the question ‘Who killed Khashoggi?’ might well remain unanswered and the world could be prompted to a conclusion that no one killed Khashoggi.